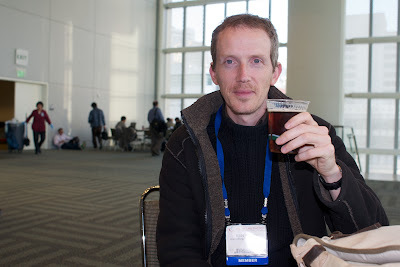 At 15:30 beer is served at the AGU, inhibitions are overcome and even us scientists become kind of chatty. After all, there would really be no point at all in gathering all those air miles if we never actually spoke to each other. 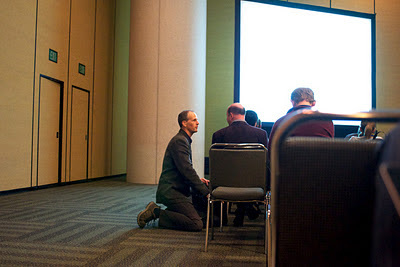 Kneeling humbly at the feet of Mike Mann. 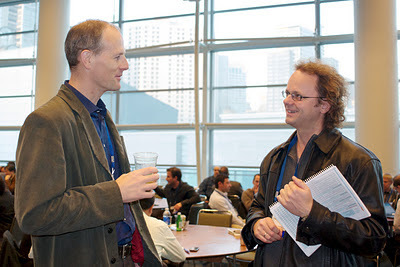 Annan-Schmittner face-off sharing a joke about skeptics or some such frivolity. A few Wayne Gretski sweaters, some sticks and you could take a team picture. What is it about Mann that makes you people fear him so? If you'd met him, you would know, and if you haven't, you couldn't possibly understand.